For the fourth consecutive year, 50 Norwalk students are participating in the Mayor’s Summer Science & Engineering Program at The Maritime Aquarium at Norwalk. This unique week-long summer experience is the result of an ongoing partnership between the City of Norwalk and The Maritime Aquarium. Norwalk students can attend the program free of charge thanks to contributions from local businesses and organizations. The 2018 program is funded by generous contributions from lead sponsor Eversource, and other organizations including First County Bank, GGP, King Industries, and Bankwell. The first session took place June 25–29, 2018. The second session starts today, Monday, July 30 and runs until Friday, August 3. Mayor Rilling will visit the Aquarium on Wednesday, August 1, at 2:15 p.m. where he will participate in a workshop where students will create a shoreline model and demonstrate erosion. Each day of the 2018 camp has a different focus: marine technology, conservation, resilience, ecosystems and animal care. 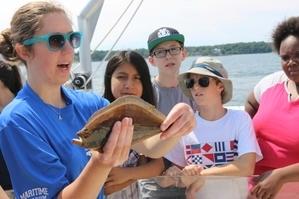 Activities include: building hydraulic arms and simple submarines; encountering live fish, crabs and other animals during a beach exploration and out on Long Island Sound aboard the Aquarium’s research vessel; designing “enrichments” for the Aquarium’s octopus; examining plankton under microscopes; going “behind-the-scenes” to see how the Aquarium operates; and more. Initial funding for the Mayor’s program came in 2015 from money raised through energy-efficiency evaluations available to Norwalk homeowners, in a program begun by the Mayor’s Energy & Environment Task Force (MEETF). Council President John Kydes, who also chairs the MEETF, Norwalk Public Schools Interim Chief Academic Officer Craig Creller, and Assistant City Clerk Irene Dixon were instrumental in putting the program together. The Mayor’s Student Engineering & Science Program is just one of many camps offered this summer at The Maritime Aquarium. To learn more about all of the Aquarium’s summer programs for ages 6-14, call (203) 852-0700, ext. 2206, or go to www.maritimeaquarium.org.